Huawei has posted a promotional image on the company’s Weibo page to announce the release date in China for the Nova 4 smartphone: December 17. The successor of the Nova 3 device comes with the latest alternative to the notch/teardrop solutions. The Huawei Nova 4 will feature a punch-hole cut-out, with the selfie camera located in the top left-hand corner. Huawei is giving consumers an additional option when it comes to choice in the “affordable flagship” smartphone sector, one with a unique selling point. 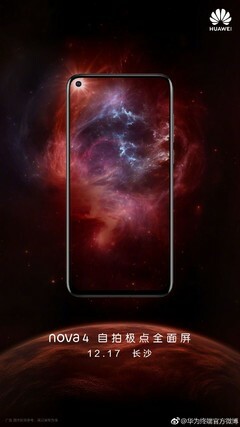 The Nova 4 smartphone, which will be launched in China on December 17, has a huge screen-to-body ratio thanks to the use of a punch-hole solution for the selfie camera. Instead of utilizing an ugly notch or compromising teardrop display, Huawei has opted to give the Nova 4 a small hole in the top left-hand corner of the screen. Expected specifications for the handset have been reported, including the use of Huawei’s new 7 nm octa-core Kirin 980 processor. 6 GB of RAM and 128 GB of storage should be available, although it is believed there will be at least one variant of the Nova 4 with an option of 4 GB RAM. A 4,000 mAh battery is apparently onboard, and there could be a dual-camera setup on the front and on the rear, like the predecessor. However, another source suggests the phone will have 24 MP+5 MP front-facing cameras and a 16 MP+24 MP+16 MP rear-facing setup. The 6.4-inch (1440x2880) Huawei Nova 4 will be initially released for the Chinese market and will likely eventually make its way to the Indian market as well. There has been a bit of a race between OEMs like Huawei, Samsung, and LG to try to be the first to get a smartphone with a punch-hole design out into the market, but this may have already been decided with an arguably surprising victor.